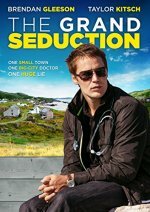 The Grand Seduction release date was Friday, May 30, 2014. This was a Limited in theaters release. The film centers on the small harbor of Tickle Cove, which is in dire need of a doctor so the town can land a contract to secure a factory that will save the town from financial ruin. Village resident Murray French (Gleeson) leads the search, and when he finds Dr. Paul Lewis (Kitsch) he employs — along with the whole town — tactics to seduce the doctor to stay permanently.